Nearly 20 years before Robert Stephenson’s famous Rocket carried its first railway passengers, there was an earlier train which had for a short while been carrying passengers. It was in July 1908 that a radical locomotive was demonstrated in London – becoming quite possibly the first ever passenger train for the general public to ride on. While steam trains had existed for a few years, they were mainly still demonstration affairs. Such fearsome beasts were certainly not for the use by people – who would surely die from shock if propelled along at such an ungodly speed of 12 miles per hour – or heavens, even faster! Anyhow, ever since the invention of the steam engine inventors had laboured with more or less success at the problem of making a vehicle propel itself by steam, but it was reserved for Richard Trevithick, a Cornish engineer of remarkable genius, to solve the mechanical problem at the beginning of the 19th century. The accepted type of steam engine at that time was Boulton and Watt’s ponderous beam engine, which used very low pressure steam and relied on the vacuum obtained by condensing it in a separate vessel, for which a supply of cold water was required. Trevithick’s idea was to use steam at a high pressure and, neglecting the vacuum, to exhaust it into the atmosphere after it had done its job. He did away with the beam, too, making the engine direct acting, and consequently so compact that it could be put onto a mobile structure – the first train engine. In 1802. he patented his “puffer engine”, as it was called, and had not long to wait for an opportunity of showing what he could do. Samuel Homphray, proprietor of the Penydarren Iron Works in South Wales, who was aware of Trevithick’s inventions, and made a wager of 500 guineas with Mr. Hill, of the neighbouring Plymouth works, that he could replace horses by steam in drawing loads of iron from the furnaces along the tramway to Navigation House, over nine miles away, and return with the empty trucks. Therefore, a year later, Mr Trevithick had manufactured a small puffer engine for the trial – which eventually proved satisfactory in spite of a few defects. However, the idea for the steam train did not really take off and it was not until 1812 that any serious attempt was made to create a serious steam engine for use on rails – and not until 1839 did Robert Stephenson’s famous Rocket complete its passenger run. However – lurking in the vaults of history is a little known attempt by Mr Trevithick to drum up interest in his puffer engine for conveying passengers, and so he came to London and set up an demonstration railway. It was a short circular route, more akin to a fairground ride than a railway for carrying passengers from one location to another – and was surrounded by a high fence to prevent non-paying customers just jumping on where they liked. The “Catch Me Who Can” was built in 1808 by Rastrick and Hazledine at their foundry in Bridgenorth, and was demonstrated to the public at a “steam circus” organized by Trevithick on a circular track in Bloomsbury, just south of the present-day Euston Square tube station in London. The locomotive reached a top speed of 12 mph – but it proved too heavy, however, for the relatively brittle cast-iron rails then in use and Trevithick closed his exhibition after a broken rail caused a derailment. The railway failed partly due to the derailment – but also due to being simply circular, the idea of it being anything more than a circus act never really occurred to people. Had it been lain as a route to convey people from, for example – Oxford St to the steam fair – then the concept of rail travel could have occurred a decade or two sooner than it eventually did. Alas, the history of the “Catch me who can” was almost lost and indeed many started to doubt if it had ever truly existed – until building works at the Department of Civil & Environmental Engineering at University College London in 2000 found part of the railway and proved that it had indeed existed. Once almost forgotten – next month will mark the 200th anniversary of this remarkable early attempt at a passenger railway – and it is delightful to know that a replica is under construction at the Severn Valley Railway workshops, initially for Bridgnorth’s Trevithick 200 celebration on 19/20 July 2008. I’ve not been able to locate the sign though – maybe I am looking in the wrong place or it has been lost. As an aside, according to The Times (yes, again) from 28th April 1932, a debate was held by the Newcomen Society for the Study of the History of Engineering and Technology where the controversy of a “brick funnel” was finally laid to rest. It seems that Richard Trevithick had been experimenting with mobile steam engines for several years and a story arose that prior to the early demonstration train that ran some 10 miles from the Penydarrani works down the old tram- road to its junction with Glamorganshire Canal at Abercynon – the original model had a tall funnel made of bricks. This naturally sounded very odd – considering that such a funnel should by rights be made from cast iron and as such some debate had surrounded the matter. However, a chief engineer who had assisted Trevitlick in his works confirmed that there had indeed been a brick funnel – but only because the cast iron one was late in arriving and Mr Trevithick refused to wait any longer to test his new train. Hence, the first and probably last time where a stream train had part of its structure made from house bricks. As soon as the cast iron funnel arrived, the bricks were replaced – and this occurred before the famous run to Abercynon. ‹ Too many security cameras – or too much hype? 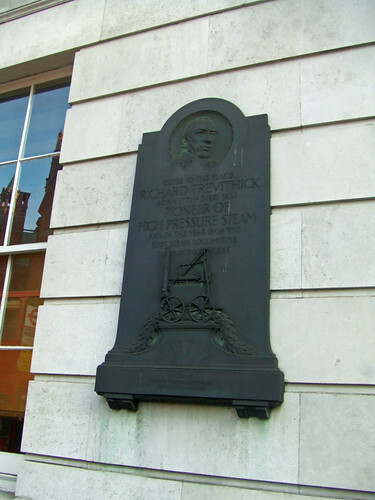 Good piece on Trevithick. You might like to know that your link to Trevithick 200 is now dead. We have a new website at ‘www.catchmewhocan.org.uk’. Good piece! love this man! too bad that being a Camden resident not enough is made of this round these parts. ho-hum. The sign is on the outside of the Chadwick building at UCL.